DTS-Net Review 2019: Is DTS-Net a Good Hosting? DTS-NET is a U.S. hosting company which was founded in 1997. A long standing company, they offer a good uptime guarantee and affordable pricing. DTS-NET is a U.S. hosting company with a long track record. Founded in 1997, they now operate out of five data centers. Their website and support are provided in American English. It’s great to see that DTS-NET own and operate two data centers in geographically redundant locations in the U.S. Their centers are SSAE 16 SOC-1 Type II, ISO 9001 and 27001 certified as well as having redundant power via UPS and diesel generator backup, fire detection and suppression, and 24/7 onsite engineers. They offer a 99.9% uptime guarantee and as they own their own centers, you can be assured they will be quick to respond to issues and less likely to oversell their resources. They use RAID Protected SSD Storage, for disk read / write times up to ten times faster than traditional hard disk drives. They offer three base packages of cloud hosting, although they do advertise that they will customize the plans upon request. The plans are Start-Up, which includes 10GB storage, Prime with unmetered storage, and Business with customizable storage. All plans come with unmetered bandwidth, unlimited domains, and subdomains, so pretty hefty resource levels all round. They also offer a solid level of beginner and expert friendly value added features. For beginners, all of their plans include a one-click installer with a premium offering of over 400 popular programs and website builder with drag-and-drop functionality plus 300 ready-made, mobile-friendly templates. If that’s not enough, beginners will love the shopping cart integrations, website statistics, and compatibility with popular CMS’s such as WordPress, Joomla!, and more. DTS-NET have also carefully considered some great features for experts and developers. They support several programming languages such as PHP (version unspecified), Ruby on Rails, Perl, Python, and more, as well as the programming modules cURL, CPAN, GD Library, and ImageMagick. To ensure your site runs optimally, they provide Cron Jobs and FTP access. 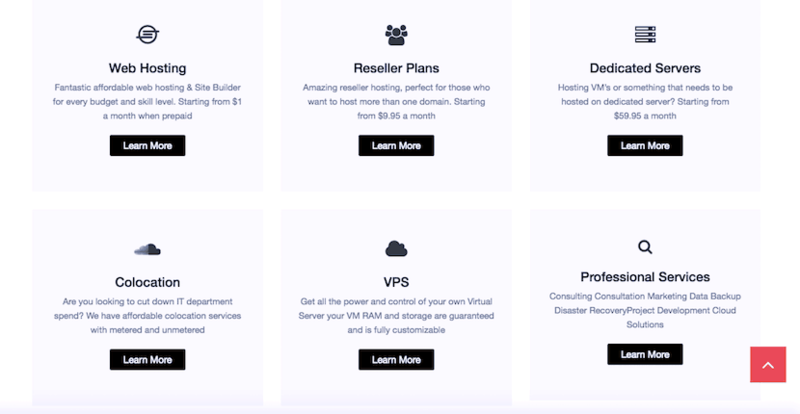 Finally, their plans are pretty customizable, and in the checkout you can add dedicated IPs, increase your data transfer or bandwidth, add an SSL certificate, and select managed hosting services. Their prices are inline with local and international competitors, if a little cheaper. The inclusions are also pretty comprehensive, so most everyday users will be perfectly happy with even the base plan. Just be sure to note, all of the additional add-ons and customizations are at an added cost, as well is domain registration. You can buy their plans in one month, one, two, or three year plans. The monthly price is reduced steeply if you purchase a longer term upfront. They offer a price match on their hosting and also a really generous sixty-day money-back guarantee. Their pricing terms are very fair. Their customer service offering is merely satisfactory. It’s 24/7/365 via telephone, live chat, and support ticketing center. They have a network status page and a small knowledge base on their website with virtually no information. Another slight gripe is that I’ve been left waiting for an operator on live chat for quite a while. onClick="trackClickout('event', 'clickout', 'Vendor Page - Visit User Reviews', 'DTS-Net', this, true);"
DTS-NET is a solid hosting company with good customer service and a respectable uptime. Not only do they own their own data centers, they have plans with features for beginners and experts, which are scalable and customizable. Buy affordable hosting at DTS-NET now! 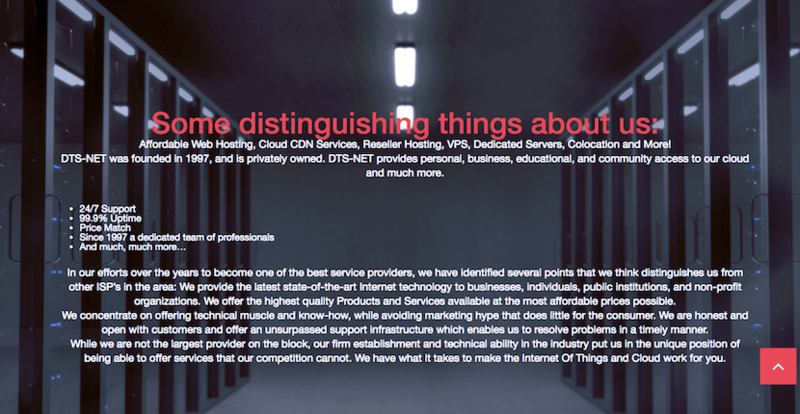 Wondering how DTS-Net stacks up against other Web Hosting companies? Enter any other Web Hosting company and we will give you a side-by-side comparison.